Waking Hours in the Life of a Wanderer: New Hourly Illustrated Journal published! I’ve just published my hourly illustrated journal from July 2017, entitled “Waking Hours in the Life of a Wanderer”. It’s here! I’m so excited to unveil the collection of prints available *only* to Patreon patrons at the $10/month level or above. The reward for this level of patronage is the selection of one print from this collection each year! Check out all the new prints here. To select your print, visit the store, and add the item to your cart. The default shipping option will be “Pickup”. I will be in touch to arrange for free shipping, pickup or delivery of your patrons-only print. Additional prints, from this collection or from the full 2017 collection, are available to patrons ($10/month level or above) at 10% off, by entering the code “PATREON10” at checkout. THANK YOU for believing in my work and supporting me in the most tangible way! Patreon is a global community of artists and their patrons — that means people like you and me. Through this site, you can make a monthly donation in support of my ongoing work, and discover other independent artists and opportunities to support their ongoing work. Unlike project-based crowdfunding sites you may already know about (like Kickstarter), which are designed to raise large amounts of money for a single project, Patreon is designed to cultivate long-term patrons of artists’ work, with monthly amounts to fit any budget. This is a bold new model in the quest to keep artists independently creating and sharing work with more people, not just collectors but anyone in the world who has access to the internet. It’s a way to pay people directly for their work. Work that you personally enjoy or benefit from in some way, or work you simply believe in. It’s a way for you to vote with your dollars, at whatever level works for you. It’s a virtual tip jar where you can symbolically high five, offer encouragement, and say to your favorite independent artist, “Keep going! I love you!”. Arts patronage has existed throughout the centuries. But now, patronage is not limited to the few aristocrats and their tastes. It is wide open to the world to participate in. We’re all in this together! From $1 to $100, every single patron makes a difference in my ability to continue creating and offering Wild Tomato Arts, wild and free. 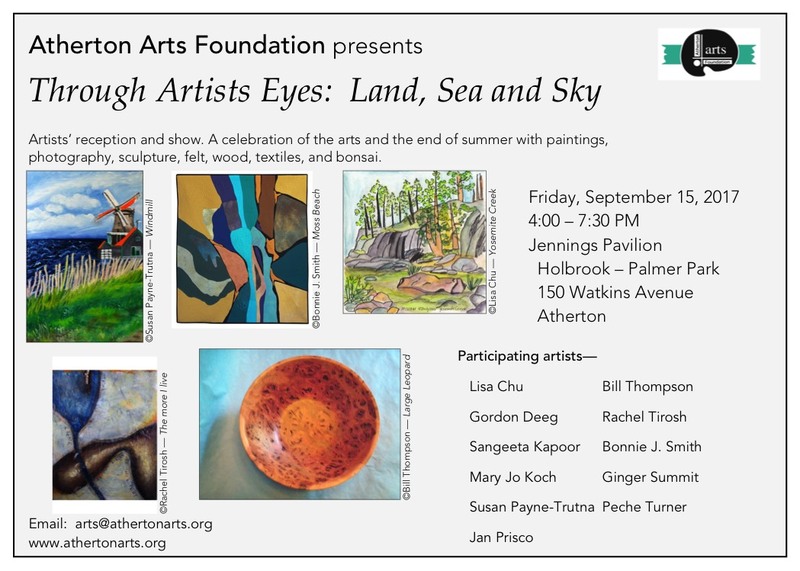 I’m honored to be one of eleven local artists exhibiting for one night only for the Atherton Arts Foundation Fall Reception on Friday, September 15, 2017, at Jennings Pavilion, Holbrook-Palmer Park, 150 Watkins Ave, Atherton, California. In celebration of the show’s theme, “Through Artists’ Eyes: Land, Sea and Sky”, I will be showing a collection of my plein air watercolor sketches, all created on location in outdoor settings during my travels to Yosemite, Gettysburg, Vermont, Idaho, and out my front door in Half Moon Bay, California. I will also have copies of my Badass Women Portraits book, prints and cards available for purchase. PRE-ORDER your copy of the Badass Women Portraits book! The design is done, the proof copy is on its way, and it’s time to announce your chance to pre-order the Badass Women Portraits BOOK! Yes, I always have big book plans from my art projects, and they always take so much longer to complete than I anticipate. But this one is DONE and ready to be printed. This book is a great way to hold the entire exhibit in your hand, and savor it for years to come. My goal is to sell 100 books by May 31, 2017….will you help me do it? The book is really an exhibition catalog of all thirty-one pieces created in thirty-one days (including ones not shown at the Bamboo installation) created for the Badass Women Portraits project, plus bonus materials, like pages from my sketchbook, and scenes from the Bold Audacious Daring Women Painting workshop and opening reception at Bamboo. I hope you will think of a woman or girl in your life who would be inspired by seeing the names and faces, plus a bit about these thirty-one Badass Women. Imagine the conversations you can start by looking at these portraits, contemplating these women’s lives, their contributions to the world we live in today, and the work we can each do, starting where we are now. Plus, I’d like to think that my own story of being a “late-blooming creative”, pursuing the creative life in mid-life, will be a beacon of light to those who are wondering what’s possible for themselves. This book is a great way to ask the question, “What makes a badass woman badass?“. You can preview the entire book here, and place your pre-order (at a special price through May 31, 2017) here. And even if you’re just inspired by looking, please share the links above and spread the word! Thank you for your grins and giggles! The price goes up on June 1st, so order yours now! Announcing Opening Reception for Badass Women Portraits show in Half Moon Bay! Join me for the Opening Reception of my solo exhibition, “Badass Women Portraits”, at Bamboo hair + body in Half Moon Bay, February 25, 2017, 6pm to 8pm. Badass Women Portraits solo exhibition by Lisa Chu, February through May 2017. The exhibit remains on display through May 2017. To see more daily art, follow me on Instagram or like my Facebook page. To become a patron of my art with a monthly donation, visit my Patreon page. If you’ve followed me on Instagram (@drlisachu), you’ve seen pages from my daily illustrated journal practice called “Before 10am”, which I’ve kept since July 2016…that’s over 150 consecutive days so far! I have kept a written journal for many years of my life, but only recently, in 2013, did I start playing with blank pages of a sketchbook, permitting not only words and sentences to appear on the page, but also colors, lines, shapes, scribbles, collage, and other experimental images. This liberating practice has led me and followed me through the daily routine of home life, to wilderness adventures in several national parks, and everything in between. This one new habit has changed my life by deepening my observations of the world around me, and slowing me down each day to reflect on what I have experienced. It has also given me an object to share with others, and a way of connecting with people around the world via social media. It’s scheduled! I will be creating an installation and visual essay at the Half Moon Bay Library, entitled “Gettysburg in 2016: What does it mean to us today?“. Through whimsical illustrations, mixed media artwork, and visual journals of a traveling artist, viewers are invited to revisit the significance of Gettysburg, the American Civil War, and Lincoln’s Gettysburg Address in our current lives — as individuals, as a community, and as a nation of diverse people. I’ll be giving an artist talk and video presentation on Sunday, November 13, 2016, at 4pm. Light refreshments will be served at 5pm. This event is free and open to the public. The installation will be at the library through December 21. The show will include new works and selected works completed during my recent 40-day residency in Gettysburg, Pennsylvania, and surrounding Civil War battlefield sites, museums, and monuments. In 2015, I wrote and illustrated a story and self-published a paperback edition book called “Too Late For Pie“. I debuted it during my November Open Studio, to a warm reception by all the adults who read it. I read it out loud at an open mic, also filled with adults, to positive reception as well. Due to cash constraints, I only printed a handful of hard copies. At the last minute, I decided to throw two copies in my suitcase for Gettysburg. While in Pennsylvania, a series of coincidences* led to my reading the book to Mrs. Cook’s third grade class at Rolling Acres Elementary School in Littlestown, Pennsylvania. What a fun, lively, engaging discussion we had! Led by Mrs. Cook’s questions, the students came up with several alternate endings, and plenty of ideas about the characters’ backstories that I had not thought about before. After a second reading, we posed for a class picture, and a few of the girls in the class approached me. “Will you be writing more books?” one of them asked me. “YES YES YES!” they chorused. “And you should send the books to us in the mail!” one of them said, while jumping up and down a little. “Well, OK! I guess I will be writing more books! But here’s the deal. Will YOU keep writing and make your own books too? And send them to me?” I said. “Uh huh,” the girls nodded their heads in unison. None of us were quite sure what we had just gotten ourselves into. All I know is I have made a promise to an entire class of third graders in Littlestown, Pennsylvania, and it’s time to get working on that next book! *Details on these “coincidences” will be revealed in a future list of all the Pleasant Surprises that appeared for me during this residency in Gettysburg. Now you can support my art on Patreon.com, a community of arts patrons revolutionizing the way creators of content are paid. Enjoy your day!